Resident of Little Rock, AR, since September 2004, Tatiana Kotcherguina is currently an active member of the Arkansas Symphony Orchestra (ASO), as well as the violin and viola faculty of the University of Central Arkansas in Conway, AR. From 2004-2010 she was a member of the Sturgis String Quartet with the ASO. From 2005-2009, she taught violin, viola, and a String Quartet class at Henderson State University. Among her other teaching positions are the music school Rhythm88 in West Little Rock, the School for the Blind, UALR, CICA International Music Festival in Eureka Springs, AR, and the Summer Conservatory in Columbia, MO. Since 2015, Tatiana has enjoyed teaching and performing at the summer camps at Wildwood Park for the Arts and most recently, in Middleburg, VA.
Born and educated in Moscow, Russia, Tatiana Kotcherguina began her studies of music in violin and piano at age of 7. An honors graduate of the Moscow State Conservatory, Tatiana also attended Southeastern Louisiana University in Hammond, LA. Additionally, she is a certified instructor of Russian as a foreign language. While in Moscow, Ms. Kotcherguina worked as Principal Violist for both the Moscow Chamber Orchestra (under V. Zverev, 1987 - 1990) and the Moscow Experimental Opera Theater (G. Provatorov, E. Kataev, 1990-1992). From 1990 - 1992, Ms. Kotcherguina taught violin and viola at the Institute of Music & Pedagogy (Moscow, Russia). From 1992 – 1999, Tatiana resided in Mexico, teaching at the Universidad Autónoma de Coahuila, Universidad Autónoma de Nuevo León, and the Musical College of Fine Arts (Monterrey, NL) as a violin and viola teacher and a chamber music coach. She was also a member of Quarteto de Solistas (UAC), String Quartet "DUX", and Associate Principal Violist of the Symphony Orchestra OSUANL. In 2001-2004, Ms. Kotcherguina lived in Jackson, MS, working as the Principal Viola with the Mississippi Symphony Orchestra and Mississippi Opera, string teacher with the JPS String Program, and a member of the MSO string quartet. 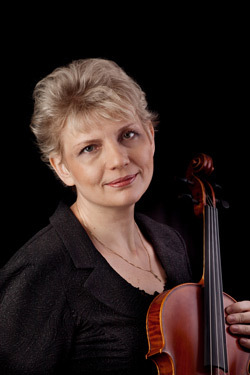 Beginning in June 2001, Ms. Kotcherguina joined the Missouri Symphony Society, participating in the annual “Hot Summer Nights” festival and serving as principal violist. Many of Ms. Kotcherguina's pupils were accepted to continue professional studies in such schools as Hartt School of Music, Juilliard School of Music, Louisiana State University, Southern Mississippi University, Shenandoah University, University of Houston, Zurich Conservatory, among others, and have successful careers in performance. Throughout her career, Ms. Kotcherguina has performed numerous times as a soloist with both symphony and chamber orchestras, and held solo and chamber music recitals for live audiences and broadcast. An avid performer and promoter of chamber music, Tatiana enjoys sharing her knowledge and craft through performances with both Nightingale Duo and Doppler String Quartet.